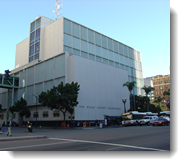 SAN DIEGO (CN) – Accused homeless killer Jon David Guerrero pleaded not guilty Tuesday to 12 attacks on homeless people that left four people dead last year. Guerrero was arrested in July but was not arraigned on murder and assault charges until Tuesday. He was stoic as the charges were read by Deputy District Attorney Makenzie Harvey. Guerrero is charged with four counts of murder, three counts of attempted premeditated murder, two counts of arson for setting the bodies of two homicide victims on fire, and five counts of assault. Court proceedings against Guerrero were stopped in October when he was found mentally incompetent to stand trial. He was returned to San Diego on Jan. 19, after doctors at Patton State Hospital in San Bernardino County said his competency had been restored. The first attack for which Guerrero is accused came on Feb. 8, 2016, when a homeless person was attacked while sleeping on a sidewalk. That person chased Guerrero, Harvey said, leading the attacker to drop and leave behind a flashlight. Harvey said the flashlight has Guerrero’s DNA on it. He said Guerrero attacked two other men late in June while riding a bike, striking both men in the back of the head. The attacks on San Diego’s growing homeless population did not gain media attention until the Fourth of July weekend when two men were killed and another was attacked with a railroad spike and survived. Harvey said Tuesday that a new murder charge has been added for the July 13, 2016 attack on 83-year-old Molly Simons, who was hit in the back of the head and knocked unconscious while walking to a bus stop to volunteer at the YMCA. Simons died in hospital weeks later from complications from a skull fracture and brain bleed. Additional assault charges were also filed Tuesday. “I think it’s pretty clear, based on the victims that he picked, most of them being homeless, there’s something going on there, but I don’t know what it is,” Harvey said. One victim who survived attended the Tuesday hearing, but Harvey did not identify who it was. She said the survivor plans to participate in the case. Guerrero was arrested on July 15 after allegedly attacking two other people downtown. Police found a large mallet with bloodstains, three railroad spikes and identification of some of the attack victims in a backpack Guerrero was carrying when he was arrested. Guerrero’s attorney Dan Tandon did not talk to the media after the hearing. A status conference has been set for May 17.